The Msgr. 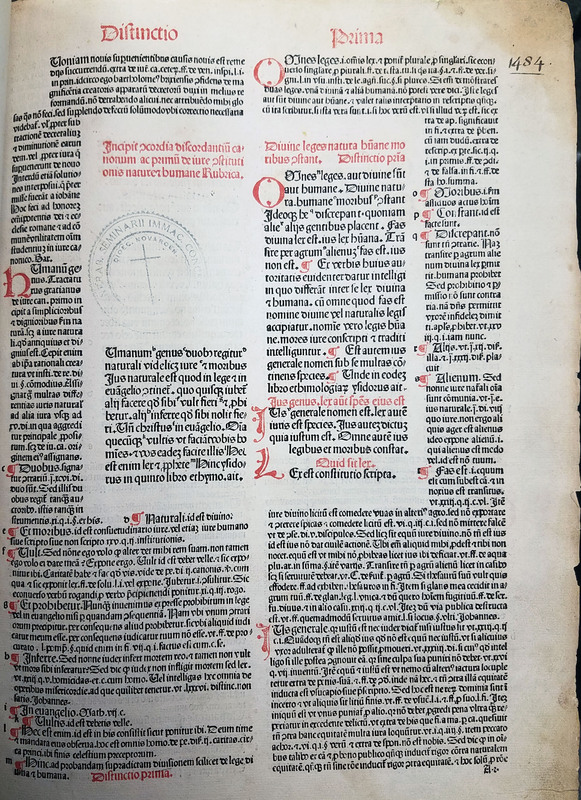 William Noé Field Archives & Special Collections Center has in its rare book collection a copy of Gratian’s Decretum, with commentary by Bartholomaeus Brixiensis and Johannes Teutonicus Zemeke. This edition was printed in Strassburg by Johann Grüninger in 1484. It is one of the few examples of incunabula in our rare book collection. 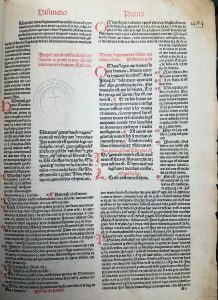 “Incunabula” are books printed in Europe prior to 1501. Gratian’s Decretum was first published in the twelfth century as a textbook of canon law. Although the Church never formally recognized it as the official version of canon law, Decretum was widely used in the study of canon law from the mid-twelfth to the early twentieth century. Commonly referred to as the Decretum Gratiani, this text is comprised of excerpts from a variety of authorities, including church councils, papal letters, penitentials, Roman civil law, regulations of Germanic rulers, and the writings of Church fathers. Gratian’s goal was to resolve discrepancies among canons, and organize the vast amount of rules governing the Church into a comprehensible legal system. Another notable find in the Archives is a proclamation by King George III. The proclamation is dated May 15, 1770. It appears to grant a parcel of land along the Hudson River in Orange County, New York to two disbanded non-commission officers, Archibald Brecken and William Arison, who had served in North America. King George III was Great Britain’s longest-reigning monarch prior to Queen Victoria, ruling from 1760 to his death in 1820. During his reign he sought to root out political corruption in Britain and enforced unpopular taxes on the American Colonies, which eventually led to the American Revolution. 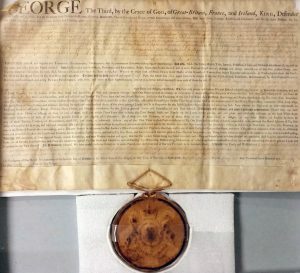 Proclamation by King George III. Brundage, James A. The Medieval Origins of the Legal Profession. Chicago: University of Chicago Press, 2014. Accessed June 8, 2017. ProQuest Ebook Central. “George III, king of Great Britain and Ireland.” In The Columbia Encyclopedia, by Paul Lagasse, and Columbia University. 7th ed. Columbia University Press, 2017. Gratianus (12th century). Decretum. With commentary by Bartholomaeus Brixiensis (c. 1200-1258) and Johannes Teutonicus Zemeke (d. 1245). Printed in Strassburg by Johann Grüninger, 4 Sept. 1484.